It is indeed an honor to serve your child for another year of learning at Roosevelt Middle School during the year of 2018–2019. We are excited and look forward to the anticipation and eagerness of our students as they fill the halls. As we move forward, we are embracing "Dignity and Respect" as a part of our new classroom management model. There are a myriad of activities and instructional strategies we have in store for all of our students and families. For example, we have band, grandparents day, student of the month, S.T.E.A.M., computer literacy, mathematics (with algebra), geography, art, tutoring, French, Spanish, and life science. These are just a few of the items students will have as part of their schedule. Parents, you are a vital piece to this equation of success in your child’s academic endeavors, so we truly welcome your involvement. The continual communication with your child’s teacher, check of homework, and the engagement of PowerSchool are so important and encouraging to your child. We thank you in advance for all that you do as we work together to increase student achievement. Under our administrative leadership for Bellwood School District 88, our mission is to enable and inspire our diverse student body to achieve academic excellence and make positive contributions to our world. Our Students: Are curious and creative learners who succeed through personal initiatives and sustained efforts to reach high academic goals. Our Educators: Teachers, staff, and administrators together form a rich professional learning community where all are supported to hone our professional craft to improve our effectiveness in educating our children. Our Families: Are active, engaged and welcomed partners in their child’s education, who give valued input and participate in making important decisions about our academic and enrichment programs. Our Schools: Are vital centers of community life, enriched by the diversity of our cities and welcoming to all families. We offer an enriched learning environment and a comprehensive system of supports to address the needs of the whole child. Please familiarize yourself with our school policies. Did you miss a flyer that went home with your student? We will also post them online for your convenience. 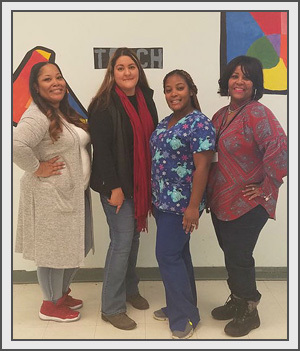 School Hours: 7:45 a.m.–2:27 p.m.
5th Period: 11:17 a.m.–12:01 p.m.
7th grade: 11:17 a.m.–12:01 p.m.
Roosevelt Middle School Bulldog PTA is a group of parents, teachers, and community members who proudly serve our students, teachers, and our community by becoming more involved in our student’s educational experience. Please join us on the first Thursday of each month at 6:00 p.m. in the school cafeteria to find out how you can be part of this amazing group. For additional information, please contact us by email. La PTA de la escuela intermedia Roosevelt es un grupo de padres, maestros y miembros de la comunidad. Sirviendo orgullosamente a nuestros estudiantes, maestros y nuestra comunidad al involucrarnos más en la experiencia educativa de nuestros estudiantes. Por favor únase a nosotros el primer jueves de cada mes a las 6 de la tarde en la cafetería de la escuela para averiguar cómo usted puede ser parte de este grupo increíble. Para información adicional por favor de contactarnos por correo electrónico.